The STPA solution provides a modeling and diagramming tool provided by yWorks, the diagramming company. The Models and Diagrams section is shown in the STPA Project Overview panel as child to the STPA Project node. 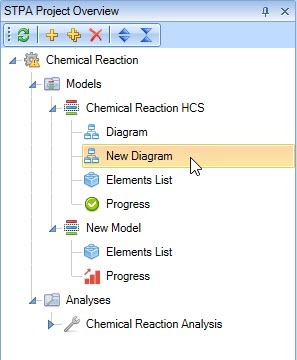 The STPA Module differentiates between models, diagrams and analyses, allowing users to navigate between while performing the analysis. In certain cases, more than one diagram can be used to represent the system under analysis. The STPA Module differentiates between the CS Model and the CS Diagram belonging to this model. The STPA Module also provides different ways of viewing the model information. The most common is certainly to view the CS as the diagrams. The STPA Module also allows users to view the information contained in the model in the form of listings. 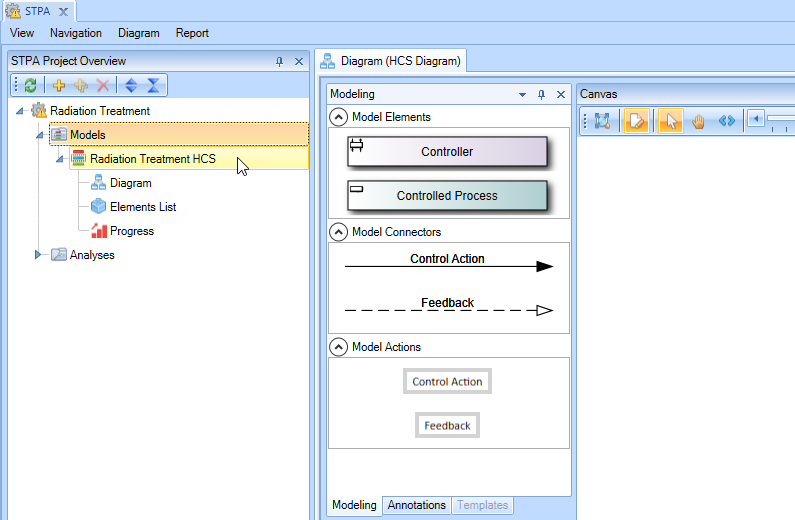 Besides the CS model and CS diagrams the STPA Module creates the analysis featuring the Unsafe Control Actions and Loss Scenarios. Every analysis references one or multiple CS models. In the above illustration the STPA project (called “my STPA Project”) contains two CS models labelled “Model 1” and “Model 2” and one analysis labelled “Analysis 1”. The analysis references the “Model 1,” which contains two diagrams, “Diagram 1a” and “Diagram 1b”. For “Model 2” only one diagram, “Diagram 2a”, is present with no analysis. Control Structure Models are created and organized under the section in the STPA Project Overview. HCS Models act as container for one or multiple HCS Diagrams. Throughout the STPA process, you may want to close various tabs only to reopen at a later time. Closing a tab in the STPA project is as simple as locating the in the top-right corner (circled and highlighted below) and clicking to execute.